Our optimized stock of measurement instruments allows us to measure small single rooms such as server rooms as well as building sizes up to 5.000.000m³. With our sensitive calibrated instruments we measure leakage areas from 0,0004 m² to 80m² and perform measurements confirming to standards. Due to our long experience we are called and come to test and find leaks worldwide. We offer the following services around the subject constructional measurements, Blower Door Test, leakage location, retention time, calculation of gas extinguishing systems for your project. Please contact us with any questions. 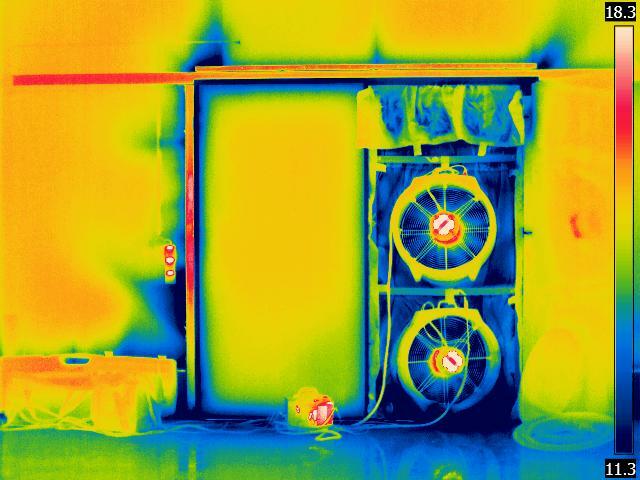 ++ Leak detection is carried out (minimum temperature difference of 15 ° C between indoors and outdoors) with infrared thermography. Otherwise, with a hot-wire anemometer or fog.